Rubbra's output reveals a unity on two levels: the musical, which is readily demonstrable, and the less easily perceived religous/philosophical, which overrides the musical and encompasses almost everything he wrote. It is universal rather than sectarian, an instinctive blend of the most spiritual and mystical elements of Buddhism and Catholicism. It led to a music that overflows with optimism and a sense of well-being, though the, at times, dramatic and conflictual aspects attest to the hard-won nature of that ultimate peace and reassurance. Edmund Rubbra's biographer Ralph Scott Grover writes in the 2001 New Grove. If Rubbra is known at all today, it is for his eleven symphonies and the violin concerto, all of which overflow with that 'optimism and sense of well-being'. But there is also some very fine and little known chamber music, including four superb quartets, that deserves to come out of the shadow of more fashionable twentieth-century compositions. The Dutton CD seen above comes from the adventurous chamber music group Endymion who also appeared on the excellent NMC disc of Elisabeth Lutyens music that featured here last year. A point of clarification at this point; the Dutton CD sleeve gives the performers as the Endymion Ensemble. There is (was?) a US group of this name. The UK band simply call themselves Endymion, and it is this group that performs on the Dutton disc. Endymion are also doing important work rehabilitating the music of York Bowen. 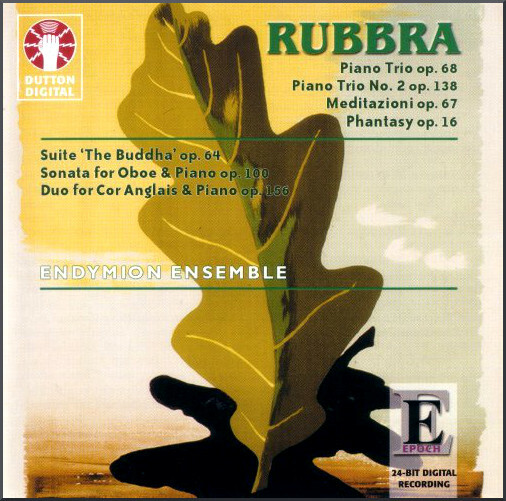 The best known work on their rewarding CD of Rubbra's music is his Sonata for Oboe and Piano, Op. 100, which was written for Evelyn Rothwell (Lady Barbirolli). Other musical connections abound in this collection of the composer's chamber music. His Phantasy, Op. 16 is dedicated to Gerald Finzi. Dutch oboeist Peter Bree, who specialises in twentieth-century music (follow the path to Jules Röntgen), commissioned and recorded the Duo, Op. 156. Arnold Bax's brother Clifford wrote the 1947 BBC radio play The Buddha for which Rubbra provided the incidental music, which became his Suite, The Buddha, Op. 64. Rubbra had a life-long interest in comparative religion, mysticism, and metaphysical literature. He briefly practiced Buddhism before returning to Catholicism. His output also included some very fine sacred choral music that is well worth exploring. This includes a Magnificat and Missa Cantuariensis for the Anglican rite, and a Latin Mass and motets. 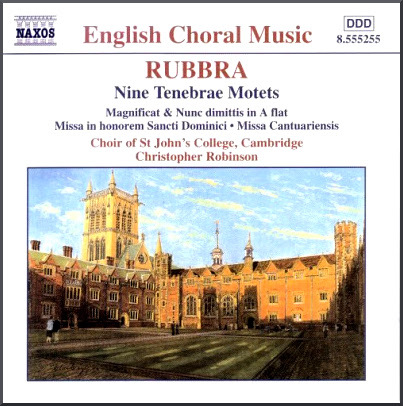 All can be found on the recommended Naxos CD by Christopher Robinson and the Choir of St. John's College, Cambridge seen below. * It is only fair to say that, for me, over the last months much of the enjoyment of blogging disappeared as self-promotion and clickbait became more important than content, and I would prefer to lay On An Overgrown Path to rest among happier memories. So this week I am burying the blog by reprising some personal favourite posts from the past. This one first appeared in January 2010.